EVEN THE BEST IDEAS CAN FAIL FOR ONE SMALL DETAIL. WE ALL KNOW THE TALK IS IMPORTANT, BUT HOW TO MAKE IT HAPPEN FOR REAL? HOW TO CREATE CONDITIONS FOR PEOPLE TO BELIEVE THE MUTUAL UNDERSTANDING IS POSSIBLE? 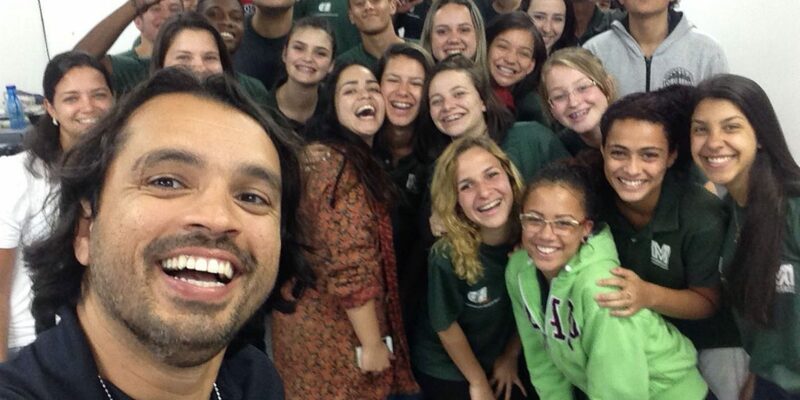 ASHOKA FELLOW ROBERTO BETO CHAVES MANAGED TO LEAD TO THE TRUE DIALOGUE BETWEEN THE YOUTH FROM BRASSILIAN FAVELA WITH THE POLICE SEEN AS THE ENEMY NO.1. Roberto ran his father-in-law establishment on the border of one of the Rio de Janeiro favelas. He turned small business into a company employing 28 people. Though he wanted all his life to “do something greater than him”, that’s why when Rio de Janeiro police announced the recruitment period he applied for testing. It wasn’t easy- the process of employment lasted quite long. Beto faced lots of procedural obstacles, corruption and other difficulties. Finally he got there. He was very good. He got promotions quickly. He got used to being sent to more and more complicated actions. He was shocked of what he’s seen. Young people kept dying in endless interventions. The most moving for Beto was everyone had accepted that. Families, neighbours, police officers. Among the armed police action victims in Rio more than 36% were 16-18 y.o. people. Thus it’s hard for the poor hoods inhabitants to consider minions of the law as their allies. And if so, forget about cooperation and next to it- prevention. Roberto decided to tear that cursed cycle and arrived at the conclusion, that the only way-out is…conversation. But how to arrange the meeting for two groups, if they don’t see each other as partners. How to encourage them for openness and trust? There was a need in someone who knows both sides of the same coin. The key were the people who passed through the resocialization process. There were gangsters, prisoners who were the example to confirm cooperation with justice dimension and minions of law makes sense. The first meeting from Papo de Responsa series- “schmooses” with police,- Beto organized in the school of his teacher friend. He took care of youngsters and guests – he himself, the police officer and “reversed” gangster- all to sit on the same level. Without desks, instructions, showing off. All had the same time limit for the speech. The police officers came to listen, not to teach. The young people were astonished. Small things such as the way people talked, the room, attention to words, sincerity of the person, who broke free from the gang world and the authenticity of the police officers who are based on the dialogue made kids trust them. On first few years of the activity Beto created the network of 100 000 young people ready to cooperate with police. Reporting the disturbing things happening, take care of each other and prevent bloody stops and clashes. He also launched the inner procedures for police what allowed to train and promote police officers who decided to treat their citizens more proactively. Beto’s program has been implemented in all the police departments all over Rio de Janeiro. It was the significant part of Olympic Games preparations. The effectiveness test points that the amount of armed police intervention reduced significantly on implementation of that solvation. Robert’s Chavez idea seems to be trivial. So, they started to talk to each other.. Meanwhile the Papo de Responsa effects saved lots of people’s lives and prevented lots of tragedies. It’s worth creating the dialogue spaces. Even if the differences that separate them seem not to be skipped.